I thought it would be fun to make a real app in this Qt Tutorial, so I made a working Notepad app. We’ll install Qt for Windows and MacOS. Then we’ll cover Qt Basics, Dialogs, Widgets, Drag and Drop Interfaces, Creating / Opening / Saving Files, Menus, Toolbars, Icons, Printing, and much more. 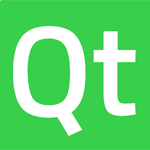 Qt is an amazing framework for creating cross platform C++ GUI applications. All of the code follows the video below. Here are the icons used. If you like videos like this consider donating $1, or simply turn off Ad Blocking software. Either allows me to continue making free tutorials. I made a small change to the code. I changed my main program code into notepad because I thought that made more sense.